The WM3431HW is another combo washer and dryer from LG that does not require an external venting source. This makes it the perfect option for those who live in small apartments or in homes with small laundry spaces. - Sensor Dry system detects the amount of moisture left in the load and adjusts the length of the cycle accordingly. - Nine wash programs allow you to choose the program that best suits the fabrics in the load. - Sanitary Cycle removes bacteria and germs using hot water. 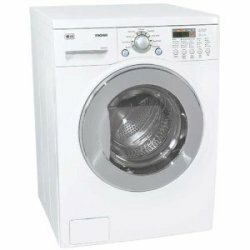 - You have the flexibility of choosing among Wash to Dry, Dry only or Wash only settings. - Choose among five temperature levels to make sure that you do not over-dry and damage fabrics. - Front loading design makes loading and unloading easier. - LED display allows you to set the programs and check on the status of the load. - Energy star compliance helps you save a lot on power and water bills. - Delay feature for at 19 hours at the maximum allows you to set the time when you want to start the machine to run. For example you can set it to start an hour before you get home so the laundry is done by the time you enter the door. - LoDecibel quiet operation reduces the level of noise in the machine. - The end of cycle beeper announces the end of the cycle so you don’t have to check on the unit from time to time. - NeverRust stainless steel drum will not rust or chip away and so will not damage or discolor the load. The combo feature means that the drying cycle automatically starts once the washing is done. This eliminates the need to unload from the washer and loading the dryer. Another big plus is the delay timer feature which allows you to set when you want the dryer to power up. The design of the unit makes it perfect for apartments and vacation homes where laundry space is limited. The unit is designed to make do without a venting system and you can plug the electrical plug anywhere where there’s a three-pronged outlet. The capacity is designed for smaller homes at about one load per person. This is pretty small for those looking for family-sized washers. Another disadvantage is that due to the design you can expect longer washing and drying times. Some users complain about the child lock which is hard to disable. Another complaint is that the dryer produces loads with more wrinkles. This is perhaps due to the cramped space inside and the absence of steam technology which can effectively reduce the number of wrinkles in the load.